Pumpkin beers have been on the shelves since July, and it seems like they show up earlier every year. Call me old fashioned, but I like to hold off on pumpkin beers till fall actually rolls around. Sure it’s a smart business decision to be the first brewery to get a pumpkin beer on the shelf so customers see their product first, but it can be annoying to see them in the summer. A Google search brings up dozens of articles if you are interested in finding out more about the phenomenon. Fortunately Rogue Ales didn’t buy into the hype and released their Chatoe Pumpkin Patch Ale in mid-September. I, for one, applaud the fall release. Pumpkin Patch Ale is one of Rogue’s many GYO (grow-your-own) beers, brewed with ingredients grown at one of the two Rogue Farms. Between the two farms, Rogue grows barley, rye, pumpkins, hazelnuts, hops, and jalapenos in addition to keeping honeybees and an assortment of more traditional farm animals. By sourcing ingredients from their own farms, Rogue can keep costs down, continue to be successful, and mitigate the effects of fluctuations in hop prices. 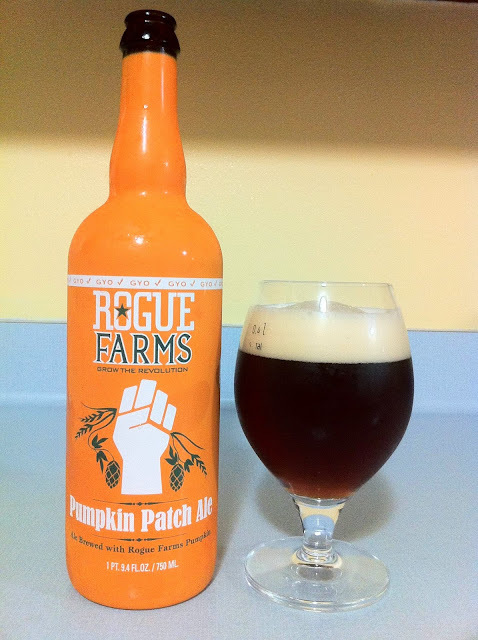 On to the review, at Beeradvocate, Rogue Farms Pumpkin patch Ale has a score of 86. Over at ratebeer, it has a score of 91 overall and a 96 for style. Chatoe Pumpkin Patch Ale pours a very clear deep, burnished copper with a thick, creamy, white head that holds moderate retention and leaves a light lacing in the glass. Sweet malts come to the forefront in the aroma, transitioning to nutmeg, clove, cinnamon and a hint of citrus before finishing with strong notes of vanilla, roasted pumpkins and roasted malts. The flavor begins with strong notes of pumpkin pie spices, with clove and nutmeg being the most prominent. The pie spices transition to vanilla, toasted malts, and baked squash, with a strong, lasting clove and vanilla finish. Pumpkin Patch is moderately malty with a low perceived hop bitterness, and a moderately dry finish. It is medium bodied with a moderate carbonation. Rogue Ales has another excellent beer in Chatoe Pumpkin Patch Ale. As I mentioned in a post last year it can be difficult to get the optimal pumpkin pie flavor in a beer, but Rogue hit this one out of the park! The only downside with this beer is that it’s $10 at my local liquor store. While it is an excellent beer and one of the best pumpkin beers that I have had it is considerably more expensive than many of the other pumpkin beers on the market. If you don’t mind the high price then by all means, pick up a bottle, you won’t be disappointed. That’s all for tonight! Have a great weekend!